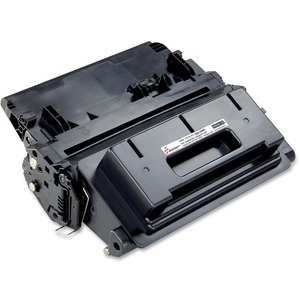 Double-yield toner cartridge is designed with a patented, high-efficiency, toner-transfer technology for use in Hewlett-Packard LaserJet 4014 and P4015. Cartridge yields 34,898 pages. Higher page yields produce savings in money, time and carbon footprint. Cartridge is made using 37 percent post-consumer content by weight and is 100 percent fully recyclable. Empty cartridges can be easily returned with the enclosed return label. Packaging is made from 100 percent recycled content.